What is a thermofax screen? Just like an old fashioned silk screen – but made with a thermofax machine. Yup – the 3m machines from way back! Don’t you just love it when people come up with new uses for obsolete technology? See this funny sweet commercial for the machine with Bing Crosby from 1964… relax with the Thermo-Fax! How much does a ready made screen cost? How much does a custom made screen cost? Same as above. Many people don’t mind printing without a frame. 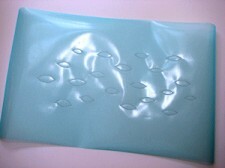 The mesh will curl so you need to stabilize it. Simply “bind” all four edges with duct tape and you are good to go. Here is a video tutorial showing you how to do that. I prefer using a frame because you can pick up the screen and move it with one hand. Order this if you would like to tape the mesh onto the frame yourself. And here is a tutorial showing you how to tape your image to a frame. If you’d prefer to rip your screen out of the package and print immediately then order it mounted. I mount your screens with waterproof duct tape on BOTH SIDES of the frame. I find that the double sided sticky tape just doesn’t last as long for me. 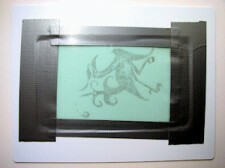 Also – with the tape on both sides you can print with your screen facing either way. Can you make a screen from my image? I’d love to make a a custom screen for you with your own image! Please read these guidelines and instructions for ordering a custom screen! Ready Made Screens can be found here. How will my order be shipped? Most orders within the US are sent via USPS first class or priority mail. International orders will be sent via USPS first class mail unless you specifically request and pay for another method of shipping. What kind of paint should I use? If you are printing on cloth you can use thickened dyes or screen printing inks or textile paints. 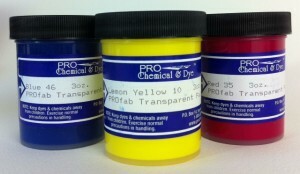 I recommend ProChem’s ProFab Textile Paint as it is highly pigmented, leaves the fabric with a lovely soft hand after heat setting, and is the perfect thickness for screen printing straight out of the jar. A bonus is that it is one of the less expensive high quality textile paints. How do I take care of my screen? There are only a few ways to ruin your screen. The first is to let the paint dry in the screen. That’s bad. Simply wash your screen gently on both sides with a soft sponge, or your fingers under running water as soon as you are done printing with it. I blot mine gently (no scrubbing) with a soft old dish towel then prop it up to dry. The second way to ruin a screen is to lay the shiny emulsion side of the screen against the shiny emulsion side of another screen while they are damp. When they dry they will stick together and the emulsion will pull off when you separate them. Believe me, it’s not pretty. 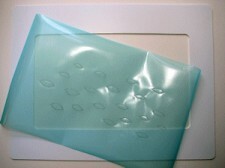 If I am traveling with my screens I will layer paper towels between the screens to keep the emulsion from sticking. How many prints will one screen make? Lots and lots and lots if you are nice to them. Try to print with the shiny emulsion side facing down. It’s tough stuff but you can eventually scrape the emulsion off if you are aggressive with your squeegee. I have screens that have given me hundreds of prints. What mesh screen size do you use?